The MBB-Kawasaki BK117 B-2 is a medium utility and transport helicopter. It is the product of a joint development project between the German Messerschmitt-Bölkow-Blohm and Japanese Kawasaki companies. 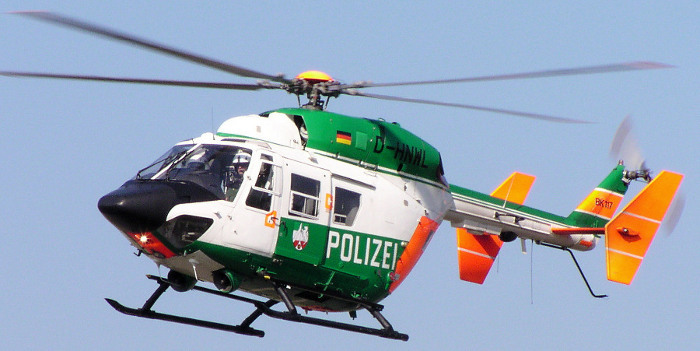 The BK117 is one of the successors to the famous MBB Bo 105, the other being the Eurocopter EC135. The joint venture agreement that led to the production of the BK117 was made in 1977, seven years after the Bo 105 went into production. At the time both companies had two twin-engine aircraft in development, the MBB Bo 107 and Kawasaki KH-7 respectively. The BK117 project replace both of these. The first flight of the BK117 happened in 1979 and the model went into official production in 1982. The B-2 variant has a greater gross weight, at 3350 kilograms. It has two Textron Lycoming LTS101-750B-1 engines as standard, a new tail rotor, better performance at high temperatures and high altitude and better flight performance overall. The B-2 variant is a notable medevac and search and rescue aircraft. It has low-vibration flight characteristics and two large clamshell doors, which makes loading and unloading emergency patients both safer and easier. The B-2 has various possible configurations. These include use as a simple passenger transport with inwards facing seats, a winch system for rescue work and extended sensor capability via an alternative sensor dome. Apart from working as an air-ambulance the ten-seater BK117 B-2 is also very popular as a VIP transport. It’s 250 kph maximum speed and 541 km range make it ideal for both roles. Across all variants there have been 443 BK117s built and production ceased in 2004. Of these 111 were made in Japan. Operators in twenty nations worldwide have purchased BK117s and many are still active today. These include the German DRF, the South African Air Force and Police Services and the Japanese MSDF. Among these there are also several medical operators in addition to armed forces and law enforcement customers that make use of the BK117.The BK117 has been succeeded by the EC145. Do you want to comment the MBB-Kawasaki BK117 B-2 helicopter?